Milo and Alex are back in a twisty and compelling tale. The body was found in a quiet suburban Pacific Palisades neighborhood with its head disfigured by a shotgun blast and its hands removed. The residents, a family of four, claim to not know the victim. When Milo feels a strange vibe within the family, he calls on clinical psychologist, Alex Delaware, to informally evaluate them. After meeting the overbearing salesman father, the overprotective mother, the athletic son and possibly autistic daughter; Alex agrees that something is simmering just under the surface. I loved this twisty tale. People that I pinned as the murderer came up dead. Motives were shuffled multiple times as I tried to solve the crimes before Alex and Milo. The ending totally blindsided me though looking back I could clearly see the red herrings and clues that I failed to identify correctly. 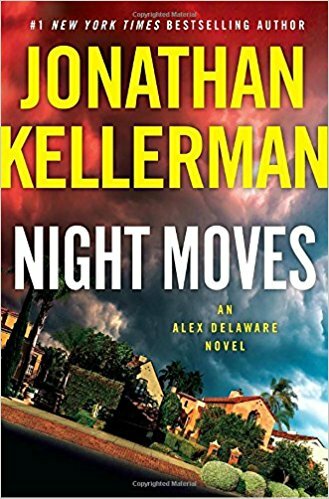 The last few books in this series have been rather lackluster but Night Moves is one of the best! Highly recommended for series fans and also anyone wanting a good challenging mystery to solve from their armchair. 5 stars! Thanks to the publisher, Ballantine Books, and NetGalley for an advanced copy.